Choose a player to be the stock market banker. The banker sets up the stock market tray. 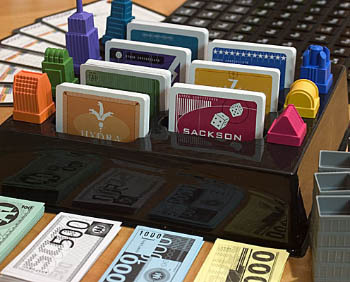 The banker gives each player an information card and $6,000 (four $1,000 bills, three $500 bills and five $100 bills). The rest of the money is separated by denomination and placed into four separate piles. Each player draws a tile from the facedown cluster and puts it faceup on the matching letter/number space on the gameboard. The player who plays a tile closest to 1A goes first. (9A is closer than 1B). Leave the tiles on the gameboard. Note: If two or more of these tiles are adjacent, they are considered unincorporated tiles. If an additional tile is added later, then they become a corporation. All players draw six tiles and stand them up so that the other players can't see them. Players must now decide as a group whether the money and stocks they acquire will be openly displayed. An open display is strongly recommended for new or inexperienced players. If money and stock are not displayed, the game is even more challenging because players must try to remember how much stock each player has purchased. Note: At any time during the game, a player may ask how many stocks of a company are still unpurchased. Play a tile onto the gameboard by putting it on its matching space. Buy stocks of any active corporations. There is a limit of three total per turn. Draw a new tile from the facedown cluster. Depending upon where a tile is played, it may form a corporation or it may merge two or more corporations. (Of course, a tile may also be played which does nothing). When a player places a tile next to an unincorporated tile already on the gameboard (vertically or horizontally - not diagonally), a corporation is founded. The corporation founder first selects an available corporation building marker from the stock market tray and places it on any one of the corporation's tiles. 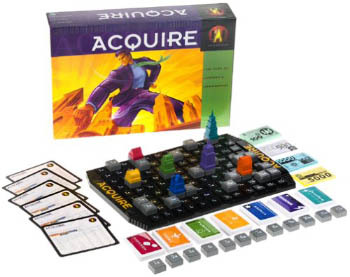 The player then receives a free founder's bonus stock (of that corporation) from the tray. Note: If players are already holding all the corporation's stock cards, then no founder's bonus stock is given out. Any tile that would form an eighth corporation cannot be played. (There are only seven corporations in the game). 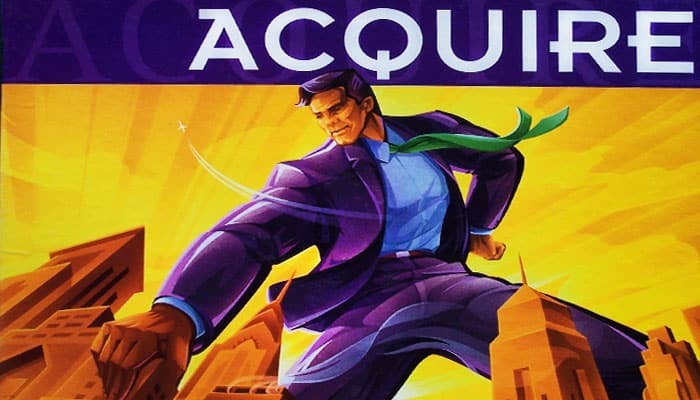 However, such a tile might be played later in the game if a merger makes a corporate building marker available again. When a player places a tile so that it connects two (or more) corporations, a merger takes place. The larger corporation (the one with more tiles) survives and the smaller corporation becomes defunct. During the merger, the merging tile does not add to the size of either corporation for any riurpose. If the corporations are the same size, then the mergemaker decides which corporation survives. The surviving corporation absorbs the defunct one. The corporation building marker of the defunct company is removed from the gameboard and returned to the tray. Note: If more than two corporations are merged by one tile, see Multiple Mergers section below for details. A corporation that contains 11 or more tiles is considered "safe" and cannot be absorbed by another corporation for the rest of the game. A safe corporation can absorb a smaller corporation, but two safe corporations cannot merge. Any tile that would merge two safe corporations is permanently unplayable and can be discarded and replaced later in the turn. At the time of a merger, all players must reveal the exact number of stocks in the defunct company that they own. The players with the most and second-most stocks are declared majority and minority stockholders. The banker pays them the majority and minority stockholders' bonuses as described below. If only one player owns stock in the defunct corporation, that player gets both bonuses. If there is a tie for majority stockholder, add the majority and minority bonuses together, divide evenly and round up to the next payable dollar amount if necessary. (The minority shareholder gets no bonus). If there is a tie for minority stockholder, split the minority bonus among the tied players. Round resulting bonuses up to the nearest $100 if necessary. To determine the bonus amount, find the defunct corporation's name on any information card. Then look down the card to the number of tiles in the defunct corporation. Then look across the card to the majority and minority bonus amounts. This bonus money comes from the bank. Note: Stockholders in the surviving corporation don't get any bonuses, but the value of their stock will probably go up because the corporation has grown larger. After bonuses have been paid out, each stockholder must decide what to do with the defunct stock. Each player, starting with the mergemaker and continuing clockwise, can hold, sell, and trade the defunct stock cards. Stock may be held in expectation of starting another corporation with that name later. Stock may be sold back to the stock market at a price determined by the number of tiles in the defunct corporation before the merger. Stock may be traded. For every two defunct stock cards traded in, the player gets one stock in the surviving corporation. Of course, the supply of surviving stock cards is limited, so you can't acquire stock that is not available. Note: Players are allowed to choose more than one of the above options. For example, a player could hold onto a few of the defunct stocks, sell some and trade some. It is possible that one tile could cause the merger of three or four corporations. The largest corporation survives and the smaller ones become defunct. The mergemaker breaks any ties. The smaller corporations are dealt with - one at a time - from largest to smallest. Majority and minority stockholder bonuses are paid out as described previously, and then the defunct stock is held, sold or traded. As usual, the mergemaker goes first. 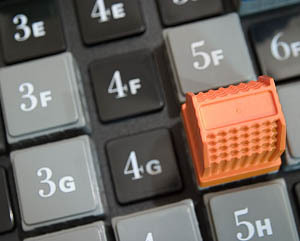 After placing a tile, the player may buy stock in any active corporation. This is optional. A player may decide to buy none or up to three stock cards on a turn. For example, a player can buy one stock card in three different active corporations - or one in one corporation and two in another - or three stock cards in one corporation. This is determined by first finding the name of the corporation on any information card, looking down the card to the number of tiles in the corporation and then looking across the card to the stock price. Money is paid into the stock market tray. Remember, there are only 25 stocks for each corporation, so when all 25 are sold, no more can be purchased. Aggressively competing to become the majority stockholder in a corporation can be risky. Invest wisely in corporations that are small and close to bigger ones. A player who runs out of money cannot buy stock. 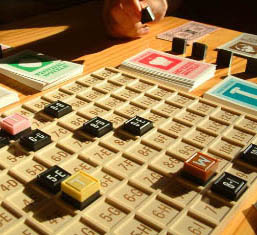 A player with no money still places a tile on each of his/her turns, if possible, but must wait for a corporation in which he/she owns stock to go defunct in order to get money. Remember, a player can sell a corporation's stock only after the corporation has gone defunct, and at the end of the game. No loans are allowed from other players or the stock market bank. A player takes a tile from the facedown cluster to replace the one he/she played. This is not done until the end of the turn. At this time, if a player has any permanently unplayable tiles (ones that merge two safe corporations), that player puts the unplayable tiles to the side (faceup) and draws an equal number of replacement tiles. This can only be done once per turn. If more unplayable tiles are drawn, the player must wait until his/her next turn to discard them. Tiles that would form an eighth corporation cannot be traded in. The game ends when one player, during his/her turn, announces that either all active corporations are safe or that one corporation has 41 or more tiles on the gameboard. A player does not have to announce that the game is over if it is to his/her advantage to continue playing. After announcing that the game is over, the player may finish the turn. Majority and minority shareholders' bonuses are paid out for all active corporations, and all stocks are sold back to the stock market bank at current prices (as shown on the information cards). Stock in a corporation that is not on the board is worthless. The player with the most money wins the game.